Residential collection includes twice a week (Mondays and Thursdays) garbage collection and twice a week yard waste collection. The Town of Redington Shores offers side yard and curbside garbage collection. We ask that you be consistent with this, so no misses occur. Time of placement for residential garbage collection. 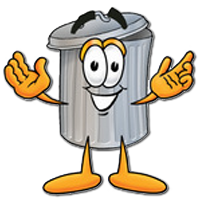 Any garbage can be placed near the curb or alley for residential garbage collection and shall be placed there no earlier than 6:00 p.m. of the evening preceding the collection day, and must be removed to an appropriate storage area not later than 7:00 p.m. of the day of collection. When not placed in a location for garbage collection, all garbage cans shall be stored on the owner’s property near the side or rear of the principal structure upon the property, in such a manner that they are concealed from the view of motorists or pedestrians traveling on any street within the corporate limits of the town. No garbage can shall be stored on any unimproved property unless a current development permit has been issued for such unimproved property. If such property is vacant, any garbage can stored thereon shall be stored in such a manner that they are not visible, being stored out of sight behind a structure thereon. Any container used for the storage and collection of garbage or trash shall not be kept or stored upon property not owned or occupied by the person who accumulates the garbage or trash. All Yard Waste (Trash) is collected also on Monday and Thursday but must be placed at the curb for pickup. Normal yard waste and trimmings of shrubs or trees are picked up as part of our service described below. “Yard Trash” shall mean vegetative matter resulting from normal landscaping maintenance and includes materials such as shrub trimmings, grass clippings, palm fronds and tree branches. All trash that can be containerized must be in containers. Such yard trash must have been generated on said resident property. Tree branches that cannot be placed in containers must be cut to (4) feet lengths bundled, tied and be of a size that one person can handle. Piles of yard waste and trimmings that are larger than the above description will only be collected if you have arranged for a special pickup upon which a fee will be charged. If you have a service for maintaining your yard that service is responsible for hauling the yard waste away. Residential Curbside Recycle pickup is on Wednesdays only. All residential property shall receive a blue recycling container. If you do not have one, please call Town Hall to obtain yours. Recycling containers must be placed curbside for pick up service. Curb Side Recycling is for residential only. Please have all containers free of food and rinsed out. Containers with food remaining are NOT recyclable. If you need to find a collection center that is more convenient, ask your full service station if they will take your oil. You can collect your oil from cars, trucks, boats, motorcycles, recreational vehicles, and lawn mowers. Drain your used oil into a clean, clear or translucent plastic container such as a milk jug. Be sure the lid is tight. DO NOT MIX used oil with other substances like paint, gasoline, solvents, antifreeze, brake or hydraulic fluid. Mixing with other substances can transform your used oil into a hazardous waste. Remember used oil doesn’t get old it gets dirty. So, when buying engine oil ask your dealer for re-refined motor oil. Buying recycled products is an important part of recycling. Hours of Operation: Monday – Friday 6 a.m. to 6 p.m. Saturday 7 a.m. to 5 p.m.
Electronics accepted: TVs, VCRs, CD or DVD players, camcorders, cell phones or smartphones, computers and/or peripherals, copiers, digital cameras, fax machines, GPS units, marine depth finders, microwave ovens, pagers, portable players such as MP3 or iPod, printer or toner cartridges, radios, stereo equipment, telephones, video game players, etc. 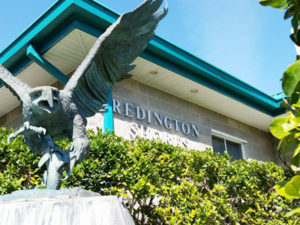 Redington Shores encourages its residents and guests to visit the Gulf Beach Library and experience all the wonderful and exciting programs the library has to offer.